I’ve been writing knitting patterns for quite a while, but I’ve recently been making bags from juice pouches and writing instructions for those too. Many of my knitting patterns are available at Ravelry (some free! ), but I’ve just opened up an Etsy shop to offer other crafty patterns and supplies. I’d be honored if you’d take a look! I’ve been a fan of your product since I was a kid myself, and I now regularly buy CapriSun juice drinks for my children to enjoy. We drink at least one carton of your product each week, which adds up to a lot of juice. 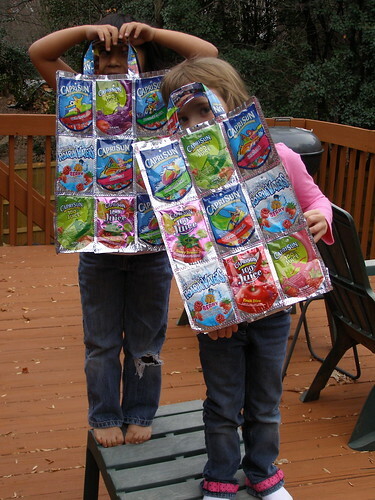 In fact, I’m currently working on a craft book which shows people how to create their own bags and totes from used (and rinsed) juice pouches, especially the rectangular pouch you hold the patent on and use for CapriSun, Kool-Aid Jammers and others. I’ve not only been saving these pouches for over a year, but I’ve asked my kids to bring home the pouches that their friends drink at lunch which would otherwise go into the trash. So you can imagine: I’m building up quite a collection of your product pouches. In the past when you’ve updated your pouch graphics, the changes haven’t bothered me. However, I’m noticing a subtle change lately that I’m not OK with: that of dropping the white ink from the regular CapriSun package. As you can see from the comparison photo above, the old style (with the flood of white ink behind the other colors) is much more visually appealing than the new style, which looks metallic and washed-out. I understand that this is a cost-saving move; in fact, given the challenging economy, I appreciate you making this decision instead of providing a smaller package for the same price. However, I’m sure you could find other ways to cut printing costs–bring back the white and drop another spot color in a new design, move to four-color process (plus white!) instead of using spot colors, or drop one or more of the flavors that aren’t selling as well as the others (does anybody drink Orange, for instance?). And one more thing: have you ever considered putting out a Variety Pack, with 10 (or 5) different flavors in a single carton? This would make for much more interesting bags for the low-volume users, and less-bored kids for the high-volume users. Just a thought.